We have sold many uncommon vintage Favre Leuba watches in the past, but have NEVER come across one of these Favre Leuba Day-Matic Waterdeep versions. This dive watch has a turning steel bezel, original black dial that has aged to a “Havana” brown colour and original handset. 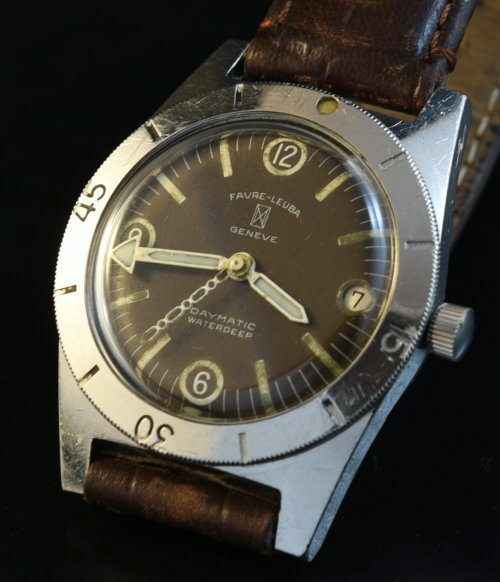 This 36.5 millimeter watch has a replaced crown, but otherwise is all original and not polished. The original automatic winding Favre Leuba movement was cleaned and is accurate. The appearance is eccentric; from the hands’ shape to the dial design. This is likely one of the rarest Favre Leuba Dive watches out there. $4250.